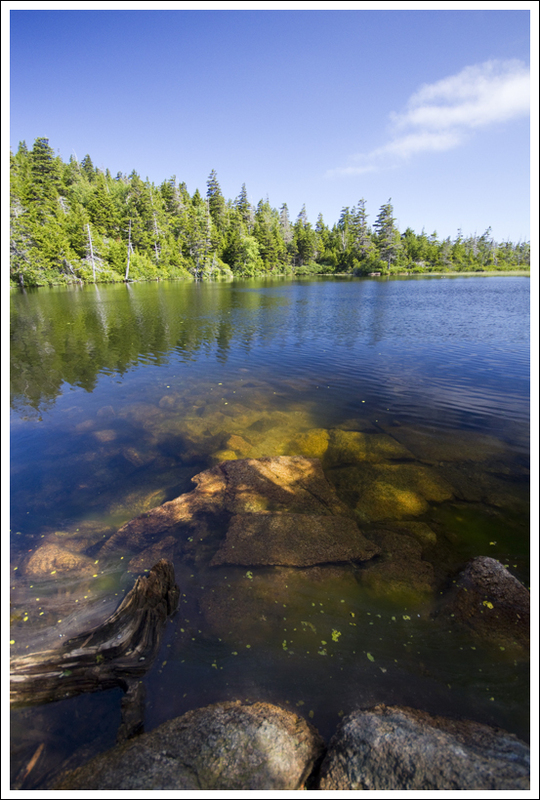 This moderate hike includes two panoramic mountain summits and views along one of the most scenic ponds in Maine. The summit of Sargent Mountain has a beautiful view. Below: The trail marker behind the Jordan Pond House; Adam enjoys the view from atop an erratic; Jordan Pond is beautiful! Hiking up Penobscot Mountain is one of our favorite hikes in Acadia National Park and we decided to save this hike for our last day there. We had hiked up Penobscot a few times before, but this was the first time that we added on Sargent Mountain. 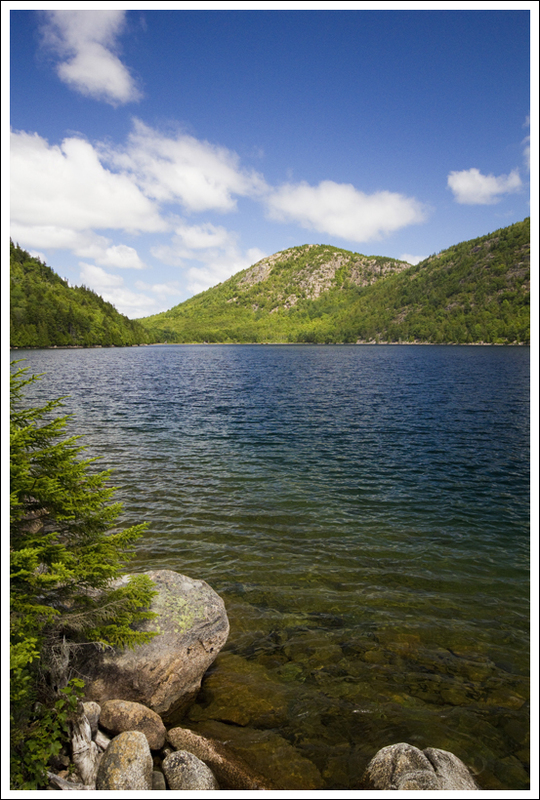 This loop hike begins at the Jordan Pond House. Facing the house, if you walk behind the left side of the building, you will see the trailhead marker not far from the bathrooms. The trail goes into the woods, crossing Jordan Stream with a small footbridge. At .3 miles you come to an intersection with the Jordan Cliffs trail (another steep option for a loop from Penobscot), but continue on the trail. At .5 miles, you will cross over one of the gravel carriage roads. The trail continues up the Spring Trail at this point. 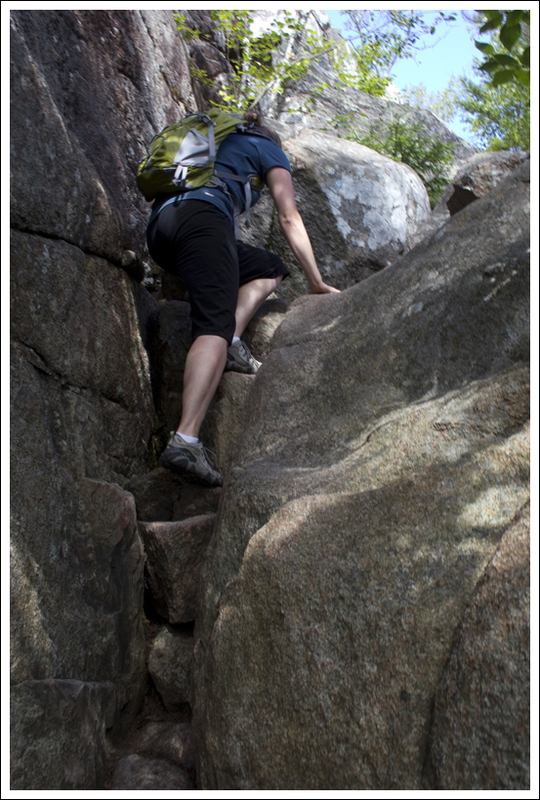 The Spring Trail consists of climbing up some rocks and does require you to pull yourself up through some tight areas. There is also one area where you will likely need to squeeze your body between a few rocks. This is the most challenging part of the hike up the trail, but before you know it, you will reach a nice viewpoint (with a stone makeshift bench) to relax from your climb up. The tricky part from here is that your eyes are drawn to the viewpoint and you could miss the continuation of the trail. Sitting on the bench and looking out, the trail continues behind your right shoulder. There is a small path behind your left shoulder, but that leads to a dead-end. Adam enjoys the stone bench overlooking Jordan Pond. Below: Christine makes her way up the Spring Trail. After you soak in the views, continue on the trail. After a short climb, the trail begins to open up as you begin your hike above the treeline on the open mountain face. The hike up from this point consists of following cairns along the way. 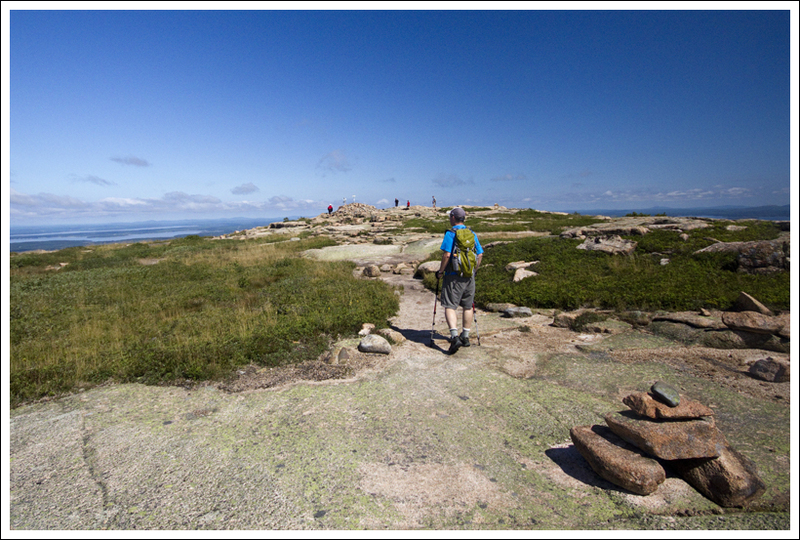 At 1.6 miles, you will reach the summit marker of Penobscot Mountain at 1194 feet. From the summit, you can see Sargent Mountain ahead, which is only a mile away. We took the path to the west, leading to Sargent Mountain. The trail descends rather quickly and you come across the scenic Sargent Pond at 1.75 miles. Take some time to enjoy the views from the pond and then continue on the trail. At 1.9 miles, you reach the junction with the Sargent Mountain South Ridge Trail. Take a right to join this trail and make your way to the peak. You will come out of the woods and hike on the open mountainside (passing by junctions with the Hadlock Brook Trail and Spring Trail) until you reach the summit at 2.6 miles. The summit of 1,373 foot Sargent Mountain provides panoramic views covering most of the areas to the north, which were not able to be viewed from Penobscot. We took a while to enjoy the views here and then followed the east trail down the mountain. This part of the trail reminded me of Scottish highlands as you hike through fields and rock. After a few tenths of a mile, the trail then begins a steep descent back into the woods. There were times that we scooted along our butts to make our way down the next section of rocks. At 3.4 miles, we reached the junction with the Deer Brook Trail. We took this left, continuing the steep descent down the rocky trail. 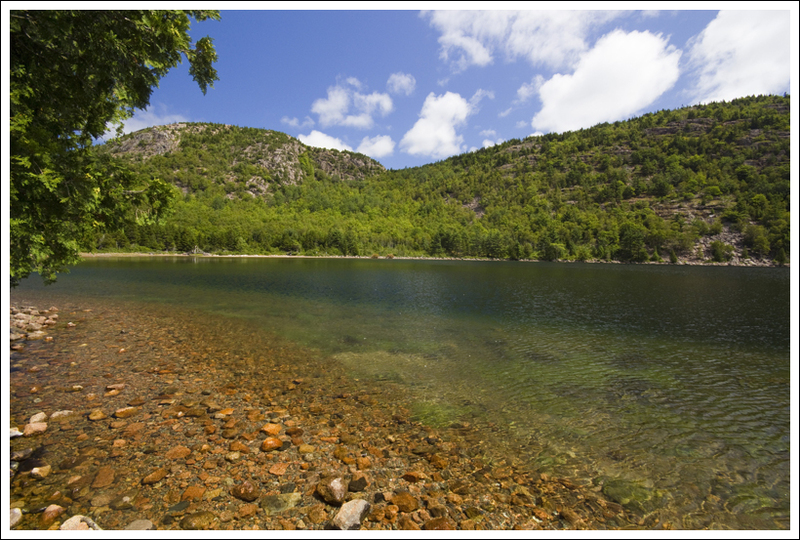 At 3.55 miles, you cross over another carriage road, pass by one of the carriage road arches, and at 3.7 miles you will reach the junction with the Jordan Pond trail. You have a choice of going either way around the pond, but we took the right to view the western side of Jordan Pond. This trail follows closely around the pond and consists of a lot of wooden boardwalks to keep people from damaging the ground below. 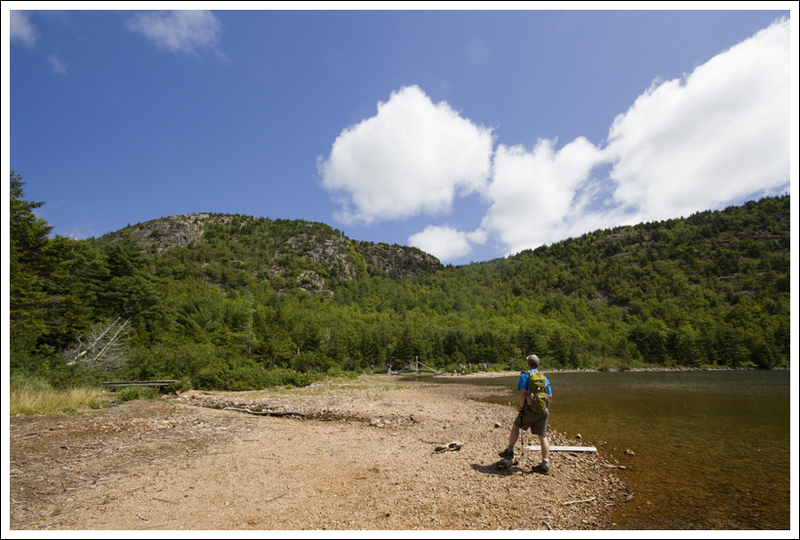 At 5.4 miles, you reach the Jordan Pond House again to complete your hike. Christine tries to roll the erratic uphill. 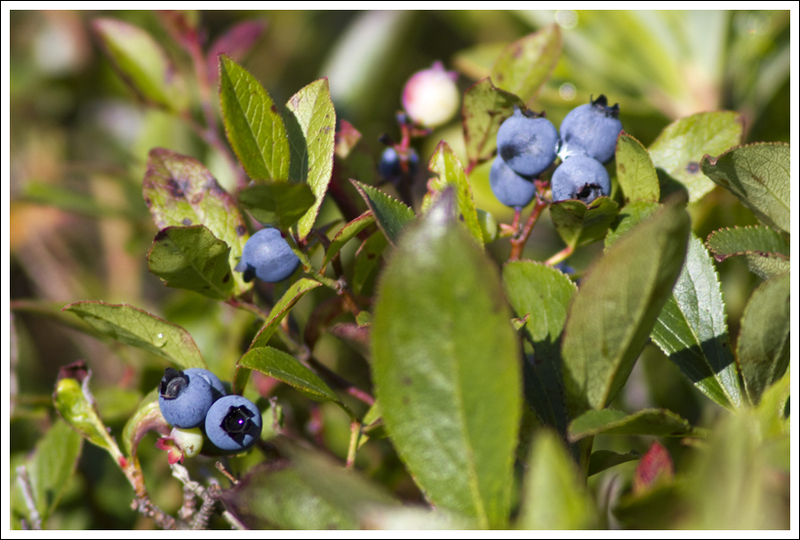 Below: Beautiful Maine terrain; Adam at the summit of Penobscot; Blueberries were abundant. 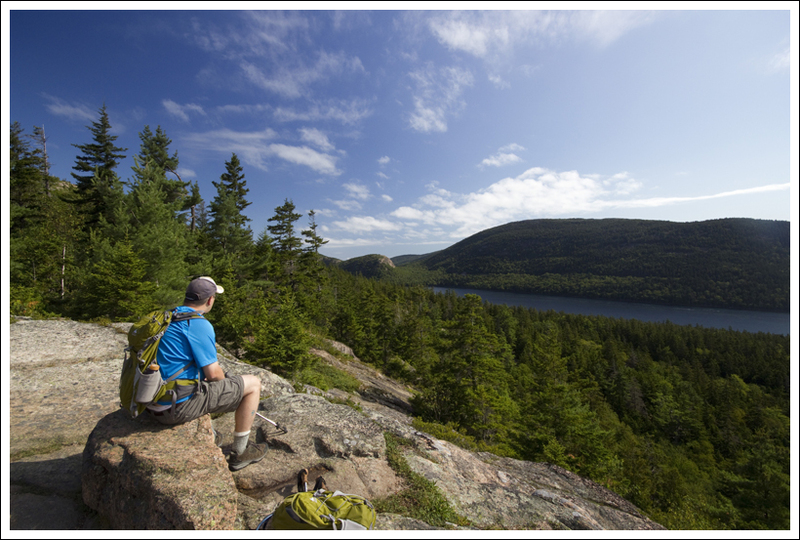 This is a perfect hike to include on your trip to Acadia. It has a combination of everything that I think this area of Maine has to offer – gorgeous panoramic views from the pink granite summits of the islands and ocean around; chances to take in some of the smaller ponds that are tucked between mountains; and challenging, rocky ascents that give you a grand sense of accomplishment. On our descent down Sargent Mountain, we came across a few different groups of hikers that were hiking up the east face of Sargent Mountain. We saw one family that was huffing and puffing their way in complete silence. I had a feeling they were regretting their decision to hike up this way. We saw another couple that were just beginning their hike up Sargent. They said they like doing the loop hike up Sargent and Penobscot in reverse of the way we went because they can enjoy views the entire way down. I think hiking up Sargent from the east face trail would be extremely steep and slow going, so I’m glad we hiked it this way. One of the great things about doing this hike early in the day, is you can claim a prime parking spot for the Jordan Pond House. This place is packed in the summers around lunchtime and you will likely need to wait for a seat. 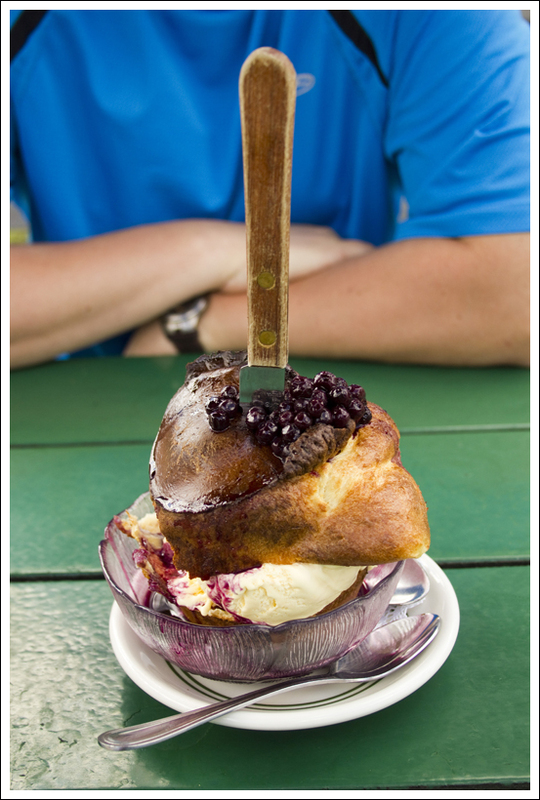 But it was great to finish off the hike with a nice restaurant and enjoy a popover a la mode with peach ice cream and blueberry sauce. We had a great week in Acadia and it always sad to leave. This has always been our favorite vacation spot and I think the hiking and biking we have done in this area show everyone why we love it so much. 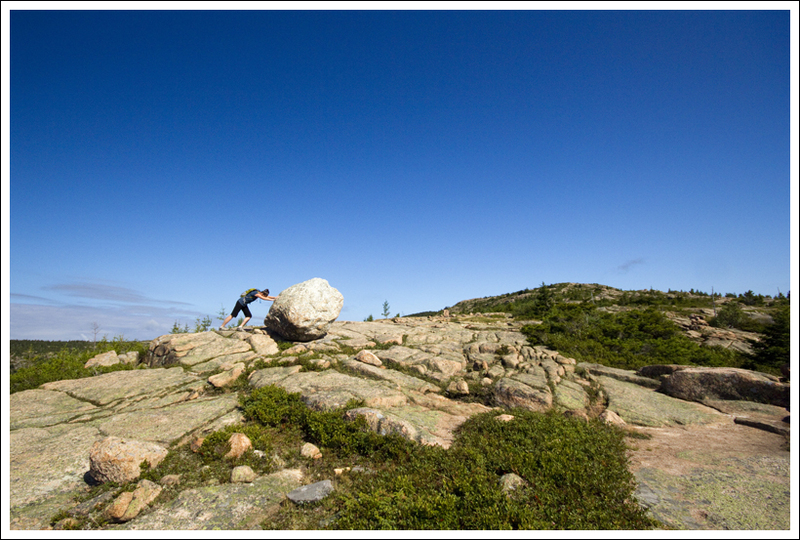 Remember how I was talking about perfect Maine days in our write-up of Gorham Mountain? Well, our last day of vacation this year was just one of those days. The weather was so perfect; I was practically swooning over it. At first, we were just going to do the 3.2-mile out-and-back to the summit of Penobscot Mountain. I told Adam that I didn’t want the day to end, that I wanted to use every single bit of it, enjoying the views and making the most of my time in Acadia. 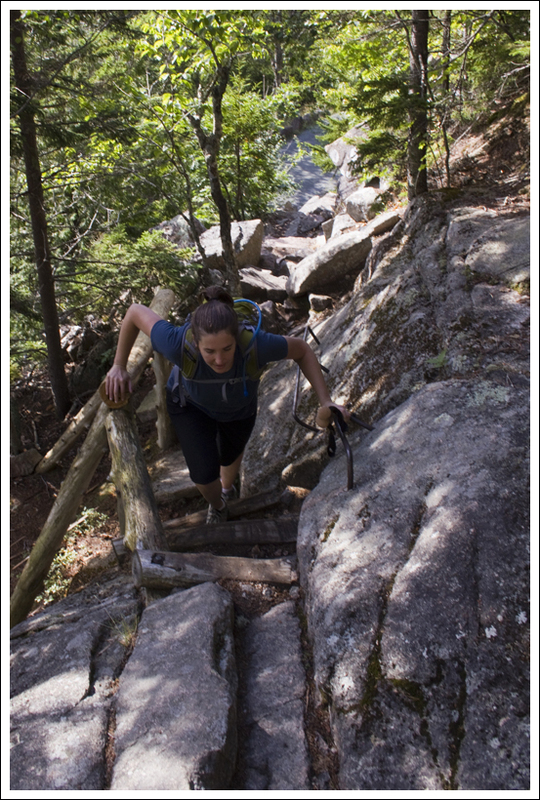 We decided to tack the summit of Sargent Mountain onto our hike (this included a climb down the East Cliff Trail, a short stretch of the Deer Brook Trail and a return walk to our starting point along the Jordan Pond Trail. After an amazing pancake breakfast at Jeannie’s Great Maine Breakfast, we headed over to the Jordan Pond House. The trailhead lies in the woods behind the restaurant. The trail crosses Jordan Stream and immediately climbs steeply uphill to where it crosses the Carriage Road. You see a trail marker, but you really don’t see trail. That’s mostly because there isn’t trail, rather there is a steep scramble between boulders. This steep pass is known as the Spring Trail. It involves a few iron rungs and rails built into the cliff’s side. Parts of the climb are extremely narrow and require four-point contact with the rocks. At the summit of Penobscot, we stopped to take in the panoramic view of Mt. Desert Island. The view couldn’t have been more breathtaking and was made even more special by the ideal Maine summer weather. It was 70 degrees and breezy with deep blue skies. A solo hiker arrived at the summit a few minutes after we did and asked if we had any sunscreen for him to use. I loaned him my pink tube of SPF50 for sensitive skin. It was probably fortuitous that he came by when he did, because it reminded me to reapply sunscreen. It’s so easy to get sunburned when hiking in Maine because of all the open exposures along the mountaintops. Also, the cool, breezy weather keeps your skin from ever really feeling hot. After the Penobscot summit, the trail climbs downward into a small wooded area between the two mountains. This is where you’ll find beautiful Sargent Pond. We stopped there for a short while and watched dragonflies whizzing about. We noticed a ‘No Camping’ sign posted right next to the pond. 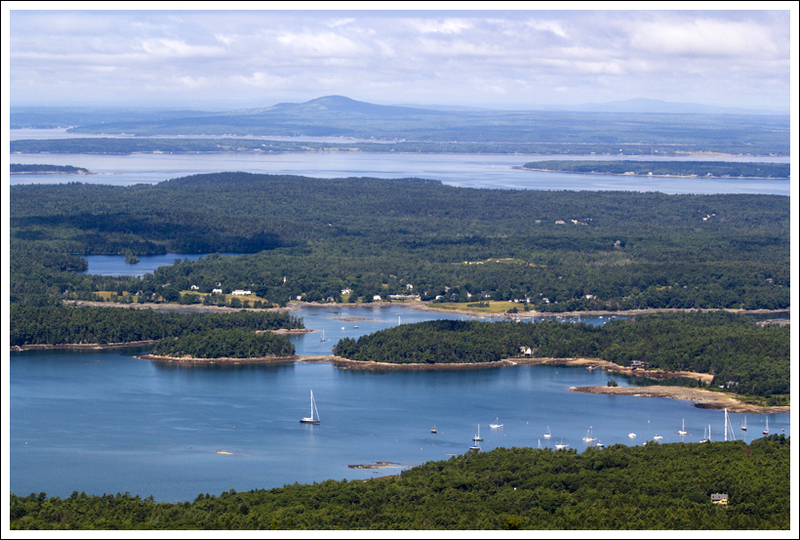 Not surprising – I bet many people have tried to stealth camp at spots like this in Acadia. 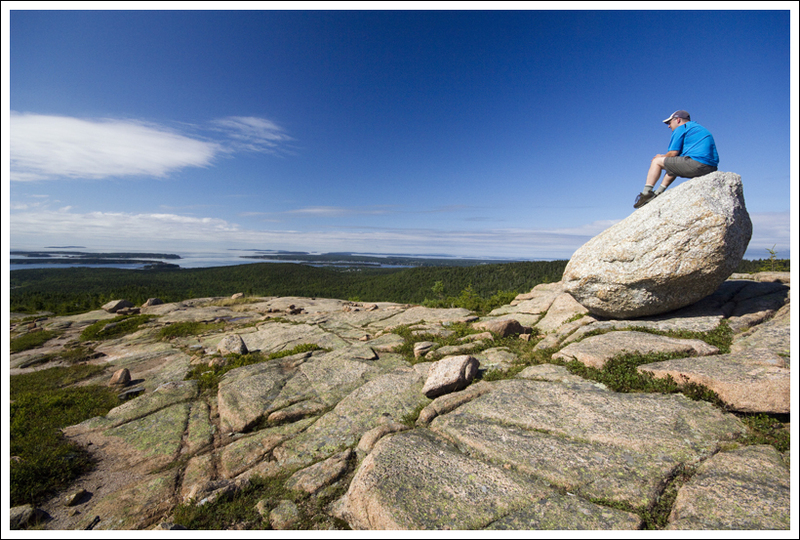 Just for the record, Acadia has no real backcountry. You can’t camp freely in the park, but there are two organized campgrounds – Seawall and Blackwoods. Probably the closest you get to backcountry hiking and camping in Acadia is if you take a boat out to Isle au Haute where there are several oceanside primitive sites. The trail climbs steeply uphill from Sargent Pond. Eventually you clear the trees once again and begin the climb up Sargent. 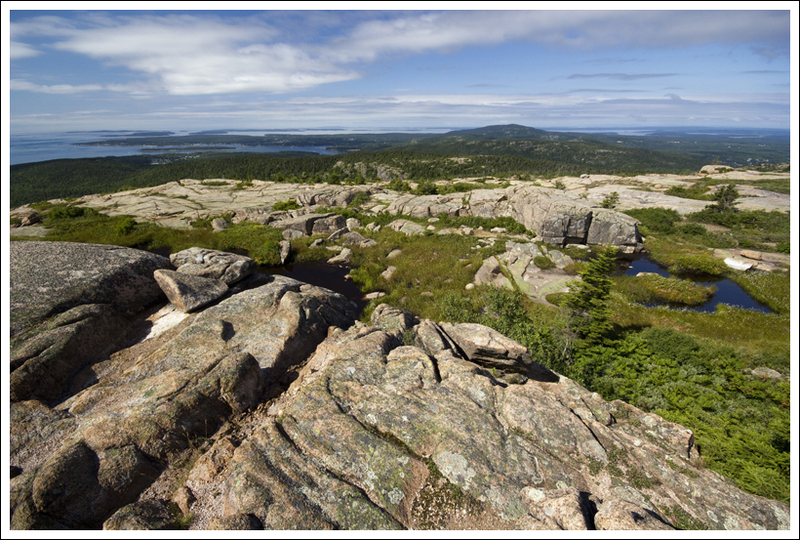 Sargent’s granite surface is not quite as bare as other mountains in Acadia. There seems to be more evergreens and low shrubbery along the way, although I’m not sure why. Hiking down Sargent. Below: This carriage road bridge passes over Deer Brook. 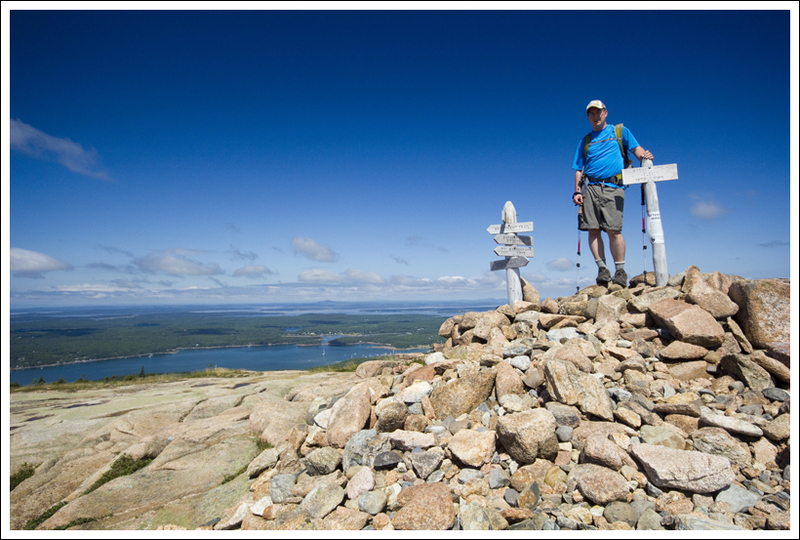 The summit of Sargent is marked the same way as Acadia’s other summits – a rock pile with a wooden sign in the middle. We really liked the view from Sargent. It was a little different from the other hikes we had done during this week. It’s the only place that offered views looking out toward Trenton and Ellsworth. The day was really clear, so we could see the airport and beyond. At the summit, we looked at a trail map so we could decide how to make our return back to Jordan Pond House. One option would have been to retrace our steps and go back the same way we came. This would have been a perfectly nice option because we could have enjoyed the ocean views the entire walk down. Instead, we decided to try out some new trails and make a big loop. The first trail on our return loop was the East Cliff Trail. It was one of the rougher, steeper trails I’ve been on in Acadia. Although there were occasional views of Jordan Pond, most of the way was scrambling down steeply across rocks and roots. The trail was pretty overgrown and I gather it’s not one of Acadia’s more heavily used trails. It was fine, though. Eventually it met up with the Deer Brook Trail which was more gentle and followed a small stream downhill. 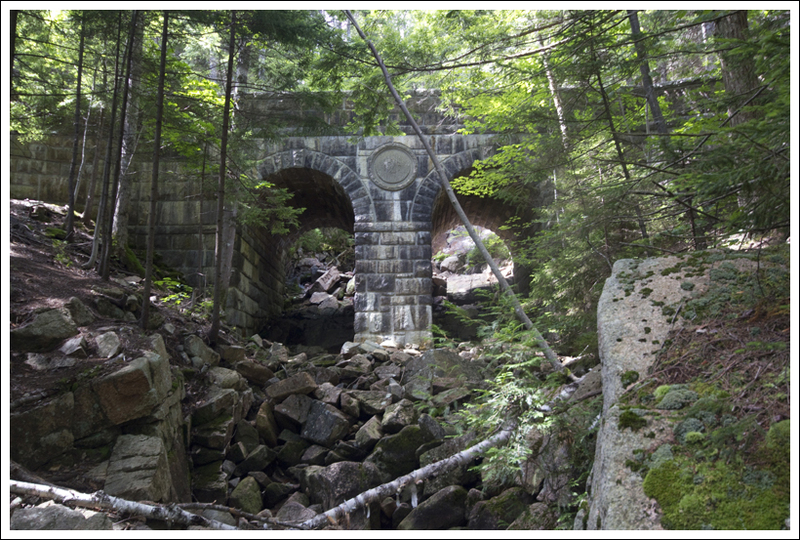 After crossing the carriage road, we climbed downhill past one of Acadia’s famous stone bridges to the junction with the Jordan Pond Trail. We came out on that trail at the far end of the pond, almost directly across from the Jordan Pond House. The shore of Jordan Pond looking toward the Bubbles. Below: Boardwalks along Jordan Pond; Lovely Jordan Pond. For a mile and a half, the trail clings closely to the edge of the lake. There are a few places where you have to climb from rock to rock. 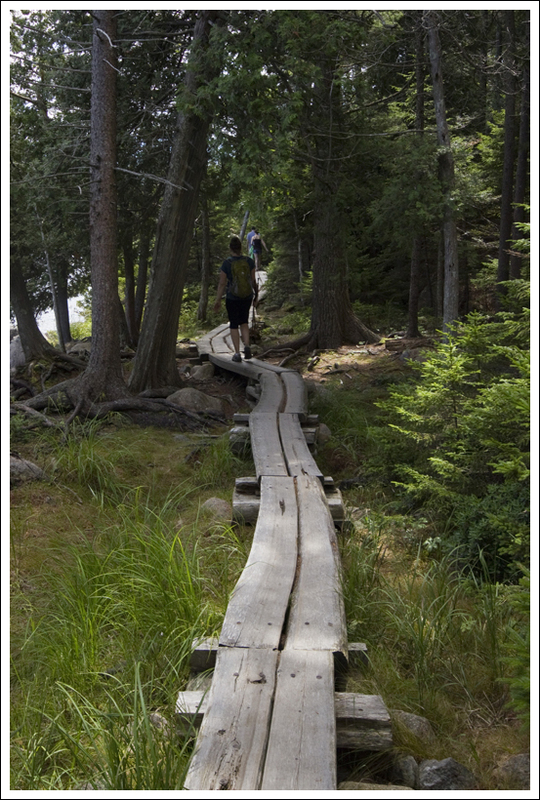 There are also many boardwalks over swampy ground that only allow for single-hiker passage. But, the trail is completely flat so it’s fast hiking. We were speeding along this easy part of the hike with popovers on our minds. When we finally got to the Pond House, we had to wait about 45 minutes for a table, but that was OK. I got some cold water, found a bench and listened to a book on my iPod until our buzzer went off. I was actually kind of cold at lunch – sweat and a brisk breeze can make even a nice summer day feel chilly. I warmed up with a big bowl of chicken-orzo soup and two huge, steaming popovers. 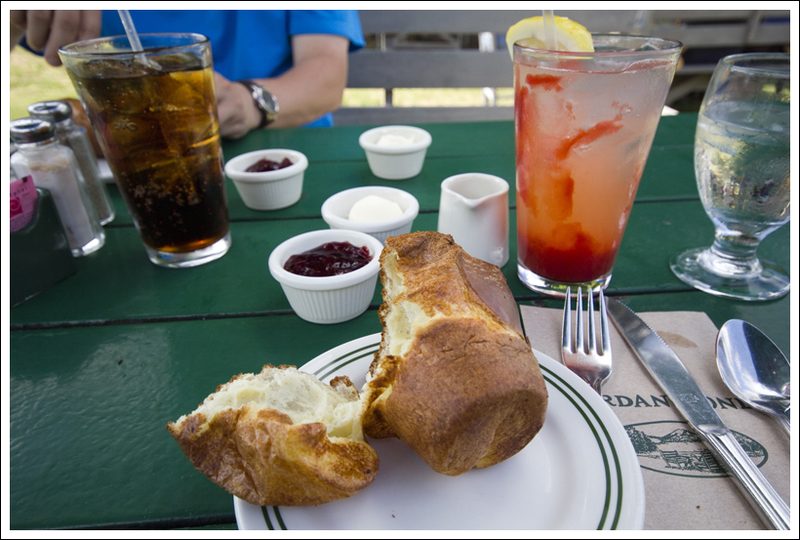 For dessert, Adam and I shared a popover a la mode. It was heaven in a bowl and a fitting end to our wonderful week in Acadia. Popover a la Mode! Peach ice cream and Maine blueberry sauce. 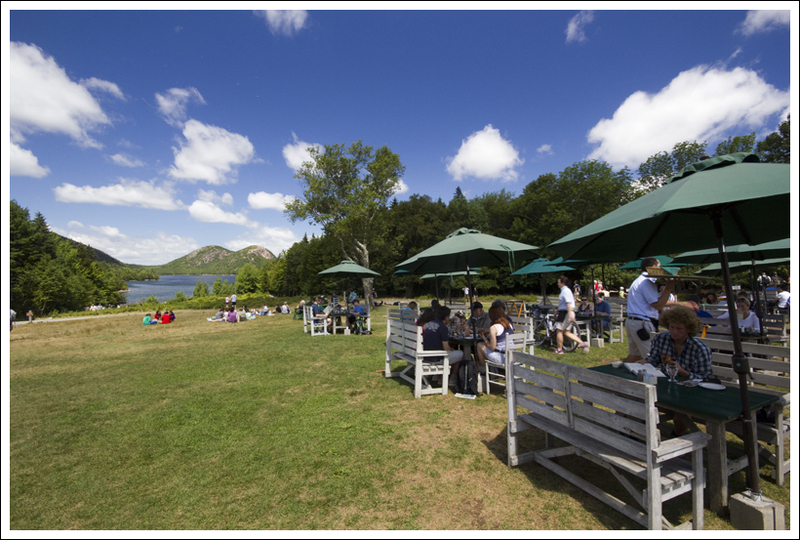 Below: Another look at Jordan Pond; Lunch on the lawn; Popover and strawberry lemonade. Elevation Change – about 1200 feet total. Difficulty – 4. The ascent up the Spring Trail and the descent down Sargent Mountain can be steep and requires careful navigation. Trail Conditions – 3.5. The trail is well-maintained, but there are plenty of places to turn your ankle on the descents. Views – 5. 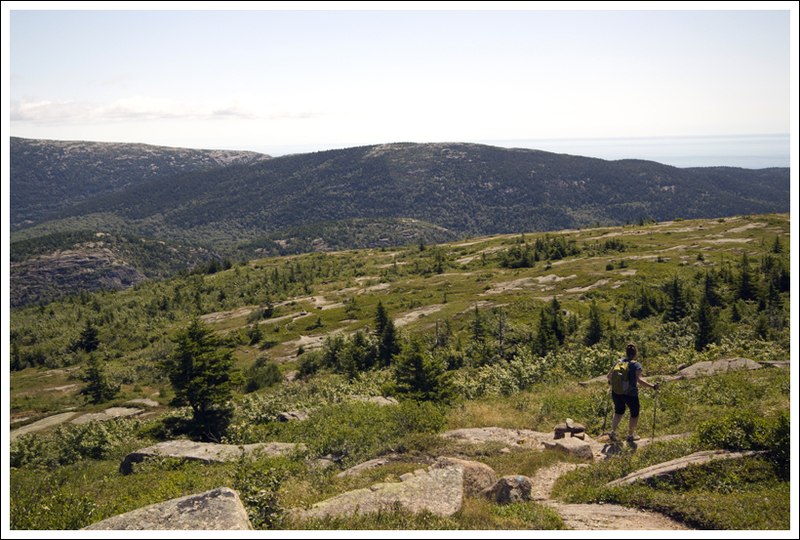 There are amazing views throughout this hike as you make your way up to the summits of Penobscot and Sargent Mountains. Wildlife – 1. There isn’t a lot of wildlife in Acadia, but we did see a red squirrel and smaller birds (juncos and other finches) along the hike. When birds of prey migrate through in the summer, you may see some different hawk varieties. Ease to Navigate – 3. There are some tricky parts along this trail on the ascent up Penobscot and Sargent Mountains, but the trails are fairly-well marked. Solitude – 3. You will likely see people at the summits lingering, but you should be able to stake out your own spots for solitude. The Jordan Pond trail will likely have lots of people on it, so you won’t have much solitude on that section. 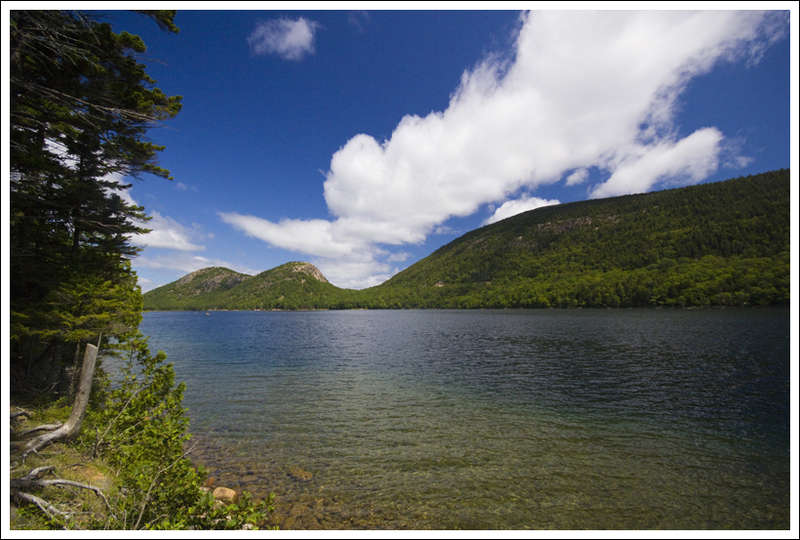 Directions to trailhead: Park at the Jordan Pond House, accessed from the Park Loop Road in Acadia National Park. While looking at the house, head around the left side and you will see the signs for the bathrooms. 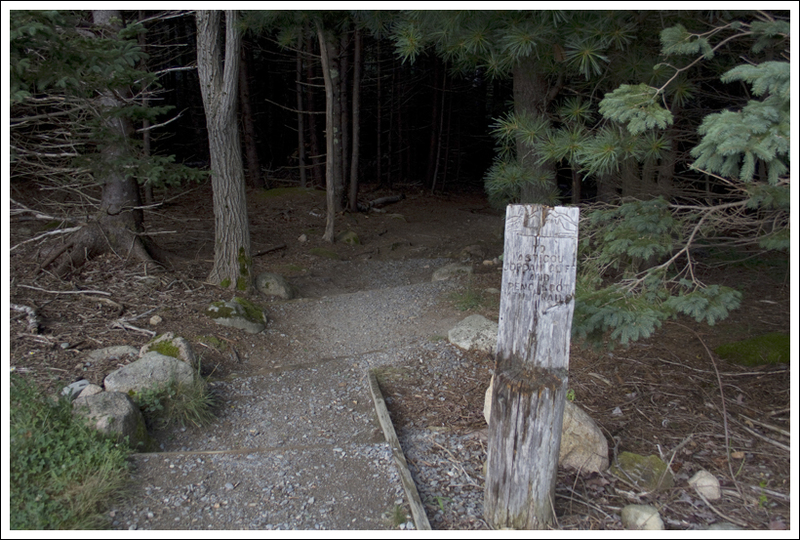 Across from the bathrooms, you will see the trail marker for the Penobscot Mountain trail. 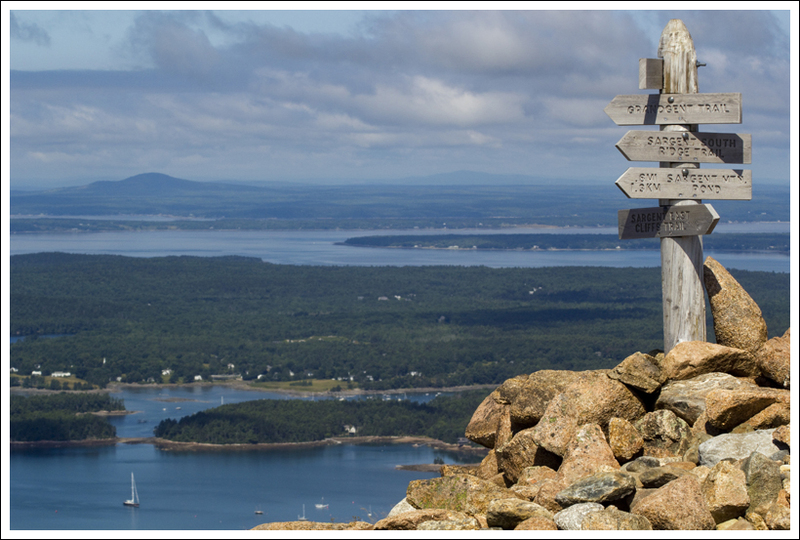 So glad I came across this post – I’m going to be travelling to Acadia alone in two weeks and am looking for challenging hikes that will also be safe to be completing alone. 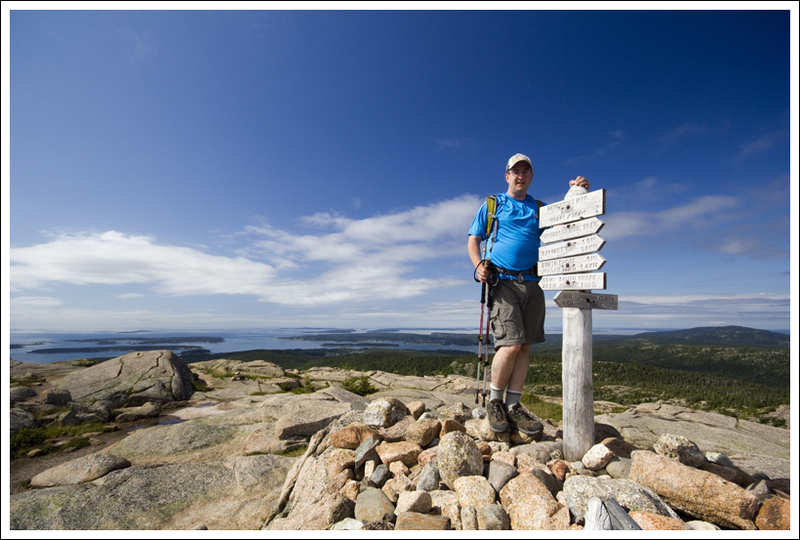 Would you say that it’d be safe to do this solo or would you suggest other Acadia trails? 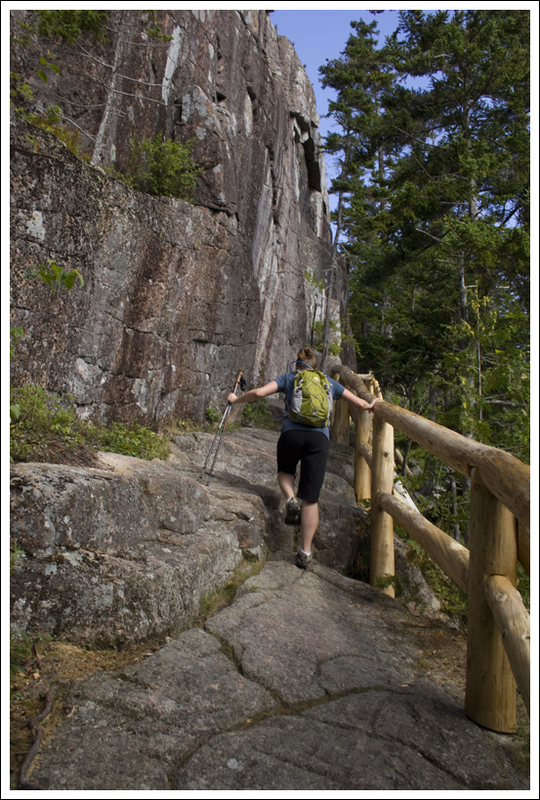 I think all of Acadia’s trails are relatively safe to go alone. The park is small, compact, and wee-traveled. You’ll never really be alone! Couldn’t possibly enjoy this description more, you guys. My brother and my girlfriend and I did a slightly modified version of this loop on a perfect-weather day last week. We had to be somewhere by mid-afternoon, so after a leisurely swim in the pond we decided to bushwhack between the South Ridge and East Cliff Trail, carefully making our way across open ledges between all the shrubs. I remember that latter trail being in pretty rough shape too, but they must have done some serious work on it in the past year or so because it really wan’t bad at all (despite what the people coming up it said). Nice accurate description and great pictures. Just did the two peaks on October 18, 2011. Enjoyed reading about your hike. Thanks! Thanks for the visit! I bet that was a great hike in fall weather!